Meaning: The word “Muharram” means “Forbidden.” Even before Islam, this month was always known as a scared month in which all unlawful acts were forbidden, prominently the shedding of blood. 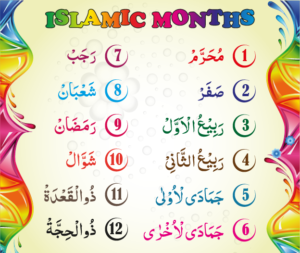 Blessing: There are many bounties of this month, especially on 10th of Muharram. 10th of Muharram: On this day he who spends more lavishly for the sake of his family members, Allah Ta’aalaa will bestow blessing upon the sustenance of the following year. 1. Prophet Adam (pbuh) was born and entered the Paradise on 10th of Muharram. 2. Prophet Ayyub (pbuh) was cured from his illness. 3. A way was made in the sea for Bani Israel. 4. Prophet Suleman (pbuh) was ordained King. 1. Hadhrat Hussain (R.A.) was martyred in this month. 4. Qiyaamah will take place on the 10th of Muharram.